Marilynn Torkelson’s native garden brings nature home. If you sit outside on a warm, sunny day and listen carefully, you might hear the humming of insects busy at work. That’s because some residents of the southwest metro are returning their yards to a natural habitat where insects thrive and flowers bloom all summer long. With Wild Ones of Prairie Edge, a nonprofit organization that is dedicated to promoting natural plants and landscapes, it is easy to gather information and support to help your backyard return to its roots. Marilynn Torkelson and Tammy Seemann began the local chapter of the nationwide organization in 2013. Monthly meetings are free and open to the public, with guest speakers lecturing on everything from invasive species to dragonflies. The best thing about Wild Ones, says Seemann, currently the membership chair, is that “you can know absolutely nothing about gardening and will learn everything you need to know.” Even Torkelson, the current president, was just starting out on her native planting journey six years ago. 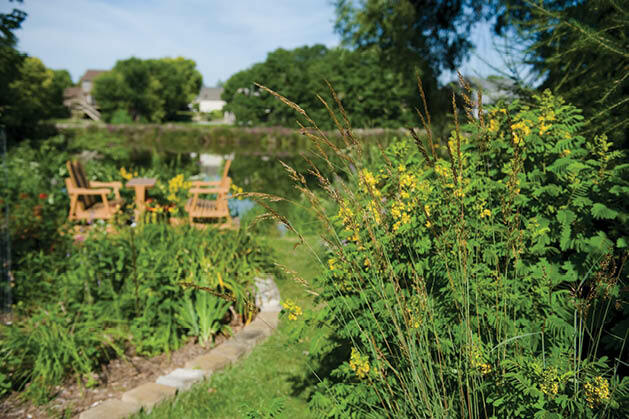 When Torkelson purchased her home in Eden Prairie, the backyard looked like any other suburban landscape: green turf grass. And like most homeowners, she and her husband, Tom, were not happy about the amount of water they were using to maintain the green. Even their rain barrel system wasn’t efficient enough. So she enrolled in a rain garden class to gather some more information about how to capture and conserve water from their yard. A rain garden, she learned, is a small depression in the ground, planted with deep-rooted native plants, that catches storm water and keeps it from running off the property into the sewer system. “The earth becomes the sponge like it was always meant to be,” she says. Because of these impressive 10-to-15 foot root systems, supplemental watering is not necessary. Torkelson was sold and thus began her passion for native plants. Today the Torkelson home has three rain gardens, an area of shoreline restoration, a full-sun prairie garden, and a shaded woodland walkway. They are even growing an oak tree, since the species is known to provide habitat for more than 500 insects. “[Her] garden is a prime example of what a suburban landscape can be transformed into,” says Seemann. Luckily, when planting with natives, it isn’t hard to keep the garden blooming all summer long. Early in the season the woodland flowers pop up, and later in August, when many traditional garden plants are past their peak, natives are in full bloom. “At the end of the season things are pretty fabulous in the garden,” says Torkelson. One of the added benefits of using native plants in your yard, points out Torkelson, is that they require very little upkeep once established. Natives don’t require supplemental watering, the roots naturally block out weeds, and at the end of the season, about 30 percent of the roots decompose and enrich the soil. When traditional gardeners are busy putting the garden to bed for the winter, native gardeners can relax since winterizing is not necessary. In fact, the insects that make their home in the plants need them to stay intact until the spring thaw. “[Native plants] got along for 10,000 years without us; they don’t need our intervention,” says Torkelson. 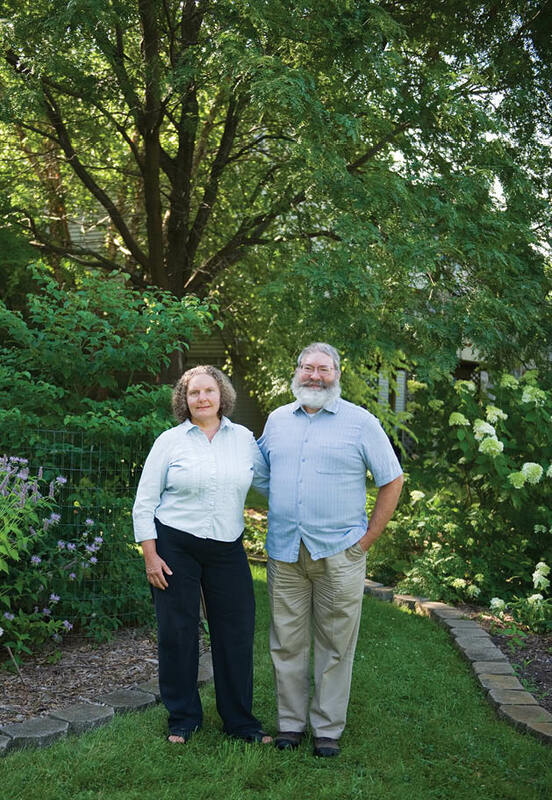 Now that the Torkelson property has native plants blooming throughout the summer in nearly every corner, the couple finds that they enjoy spending time in their yard. “Well, no one would go outside to look at grass. So suddenly your yard just becomes fascinating,” says Torkelson. “There’s always something going on.” From birds doing mating calls and collecting material for their nests to “soldier bees” acting as bullies, the garden is abuzz with activity. Torkelson is proud to be a part of an organization that helps people make an environmental impact right at home. “If you own land … there is something really amazing you can do for the environment: convert it back to native plants,” she says. Bring natives into your own habitat. A traditional rain garden is another great starter project that doesn’t require a lot of space. Seemann recommends finding a patch near your driveway where you can direct water runoff to keep that water from running back into our lakes. If you live in Eden Prairie, there is a water quality rebate you can apply for that will give you 50 percent of the cost of installing a rain garden, among other things. 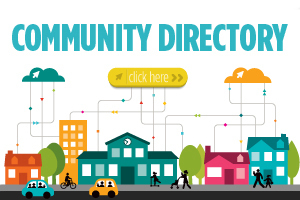 You can also get grants through your watershed district. 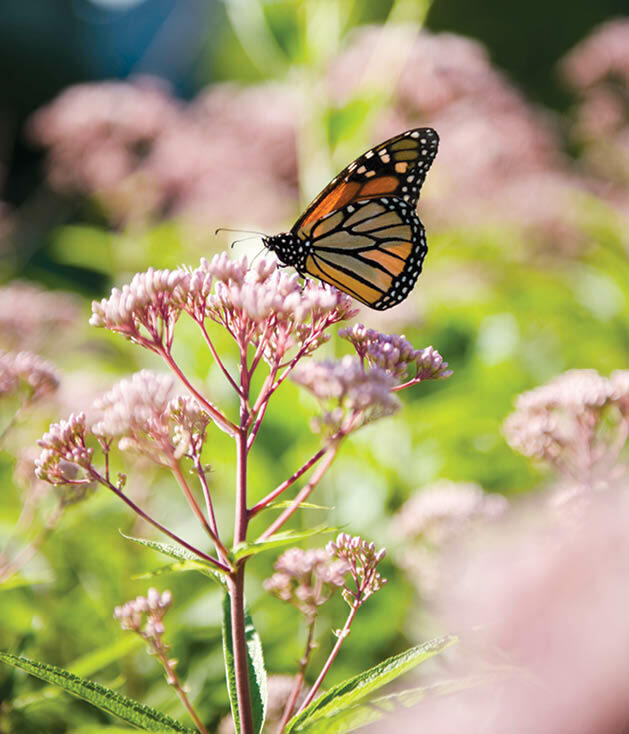 Recommended reading: Pollinators of Native Plants, by Heather Holm, vice president of Wild Ones of Prairie Edge. For information on attending a Wild Ones meeting, touring a garden (including Torkelson’s), or starting your own native plant project, visit the website here or email wildonesprairieedge@gmail.com.